A few weeks ago, I entered a ‘mystery ingredient’ contest. I had no idea what the ingredient would be! A spice? Some specialty flour? Nuts? I was surprised and excited when I received Colman’s Mustard Powder and Spicy Mustard. 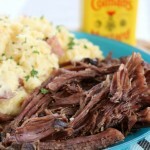 I began experimenting and created this slow cooker Beef Roast with Spicy Mustard recipe. Well, the contest has just begun, and I need your vote (I’m the forth from the bottom)! Since you’re busy, I want to thank you for taking the time by sending you a FREE copy of my eBook 10 Steps on How to Stay Healthy (I’m not above bribing). Please leave your email address in the comments below or comment on this FB feed after you vote, and I’ll happily send you my book. In the meantime, enjoy this juicy, tender, and flaky beef roast for dinner. Place roast on flat surface. In a small bowl, combine mustard powder, salt, pepper, garlic powder, and onion powder. Sprinkle half of mixture evenly over roast. Meanwhile in a large skillet, heat oil over medium heat. Add roast and brown for approximately 1 minute on each side. Transfer roast and contents to large slow cooker. Pour remaining mustard powder mixture and beef broth over roast. Cook on HIGH for 6 hours or on LOW for 9 to 10 hours. If your roast beef is still tough, cook for an additional hour. Thank you for voting, my friends! ohhhh bribing, smart 😉 if only I didn’t already give all my printables and patterns away for free! it’s so fun seeing what everyone came up with! Hahaha… thanks, Ashlee! I agree. It’s fun seeing each others creations. I’ve voted for you too. Voted! So glad I saw this before I went to the store. I’ll be getting everything in order to make it for dinner tomorrow. Thanks, Melissa! I hope you enjoy it. I’ll be sending you an eBook! Fun idea! I voted for you. The recipe looks delish! Thanks, Kimberly! I’ll be sending you an eBook.